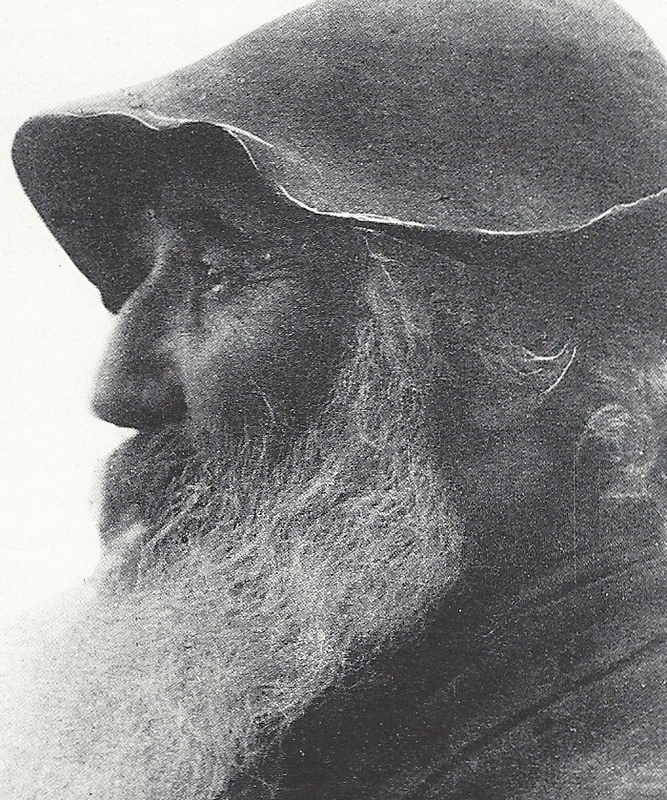 This blog about Impressionist Camille Pissarro (artbookannex.com) has just counted 300 readers in less than two months! Readers include art lovers from 19 countries—Argentina to the US, and five continents. Most (84) are in the US, with France coming in second (39), but the list also includes Serbia, Singapore, Lithuania, and Thailand. Thank you so much, merci beaucoup, and in every other language for sharing our thoughts on the beautiful, interesting, and often puzzling art of Pissarro. 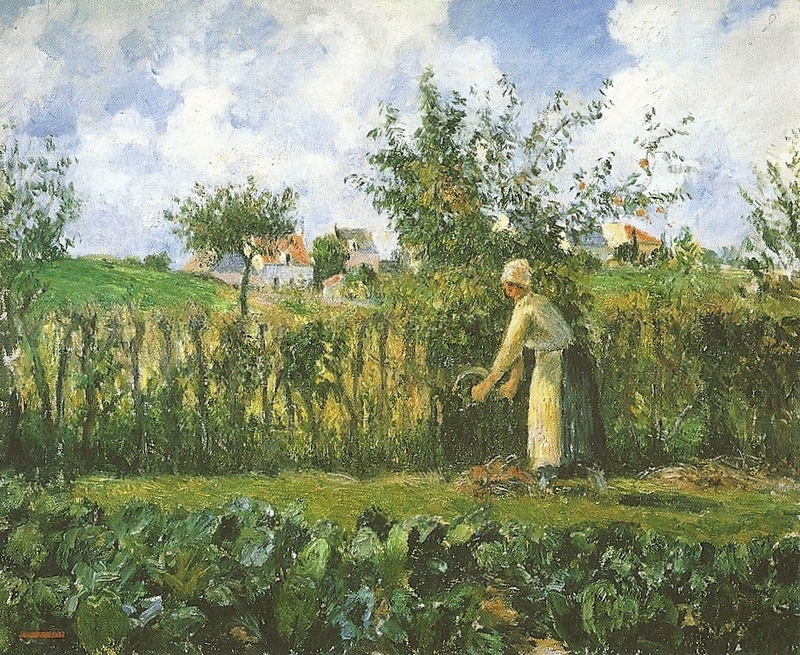 Pissarro often gives us lots of information about his paintings. Here, he tells us the location, the time of day, the season, and the weather. But Spring can be changeable. On this April day in 2012, the sun creates the illusion of warmth, but it is cold enough for coats and hats and a brisk wind keeps things chilly. It is impossible to tell from Pissarro’s painting if it was warm or chilly, but many people are enjoying the sun. The sunny glow of the Tuileries Gardens creates a green oasis in the midst of the city, with its lines of trees, formal lawns and flower beds framing the circular fountain. 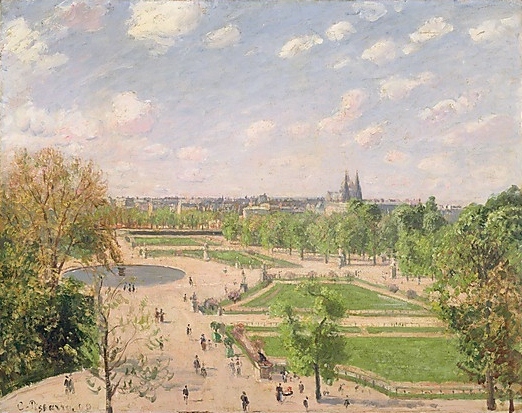 Looking from his apartment window on the rue de Rivoli, Pissarro uses the very symmetrical design of the Tuileries Gardens to form a distinctly asymmetrical painting. He places the circular pond on the far left, a bright patch of blue, and allows the various walkways between the green lawns to lead our eyes to the right. It is interesting to note that this view looks very nearly the same today as it did when Pissarro painted it. In the distance, we see the steeples of Sainte-Clotilde, across the Seine on Paris’s Left Bank. In other paintings of this same view that Pissarro made in 1900, the construction of the Gare d’Orsay (now the Musée d’Orsay) is visible. Durand-Ruel, Pissarro’s art dealer was well pleased with both of his Tuileries Garden series and bought a number of them to sell to his clients. It seemed unlikely that Pissarro paintings would be in Florence, Italy. But there it was in the index of the Pissarro Critical Catalogue (Joachim Pissarro-Claire Durand-Ruel Snoellerts, 2005). I had been to Pitti Palace before, but once again I was astounded by the opulence of the building and its furnishings. Upstairs in the Modern Gallery, I glanced in the side rooms, most of which were cordoned off with velvet ropes. Inside one door was a small painting with familiar contours and shades of green. It was Pissarro’s “Landscape Near Pontoise” (PDR 517). Just to the right and up higher, I thought I saw another Pissarro. I couldn’t be sure since there was a glare on the glass. I stood for a long time, straining my eyes but unable to really see either painting. After a few minutes, she came back with a security guard, who as he approached me was already shaking his head no. He looked at me and I began my story again. I’ll never know if he understood what I said, but he obviously understood my longing. “Just one minute,” he said as he lifted the velvet rope. Inside, I had a perfect view of the landscape and was able to study the other painting, “In a Kitchen Garden” (PDR 558). The three of us—me and the two guards—stood there talking about how magnificent the paintings were. We attracted a small crowd drawn by the unusual event, so I had to go. But I had a good look at paintings that have probably been seen by very few people, compared to other Pissarro paintings in museums. The Landscape was painted in 1877, and the Garden was painted in 1878, both of them while Pissarro was living in Pontoise. Both were painted after the Third Impressionist Exhibition in April 1877. Both were purchased in Paris by the same man, Diego Martelli, an art critic from Florence, Italy and a friend of Degas. Martelli was a prominent supporter of the Macchiaioli, a group of Italian artists who painted in plein air and focused on light and color in much the same way as the French Impressionists. Since Martelli took them home, the Pissarro paintings have never left Italy. Martelli loaned them both to an exhibition “Esposizione della Società di Incoraggiamento delle Belle Arti,” at the Pitti Palace in 1879. They were then bequeathed by Martelli to the Palazzo Vecchio, Florence. Since 1924, they have been in the Galleria d’Arte Moderna at the Pitti Palace. They have been featured in exhibitions of French paintings in Florence, Rome and Venice. 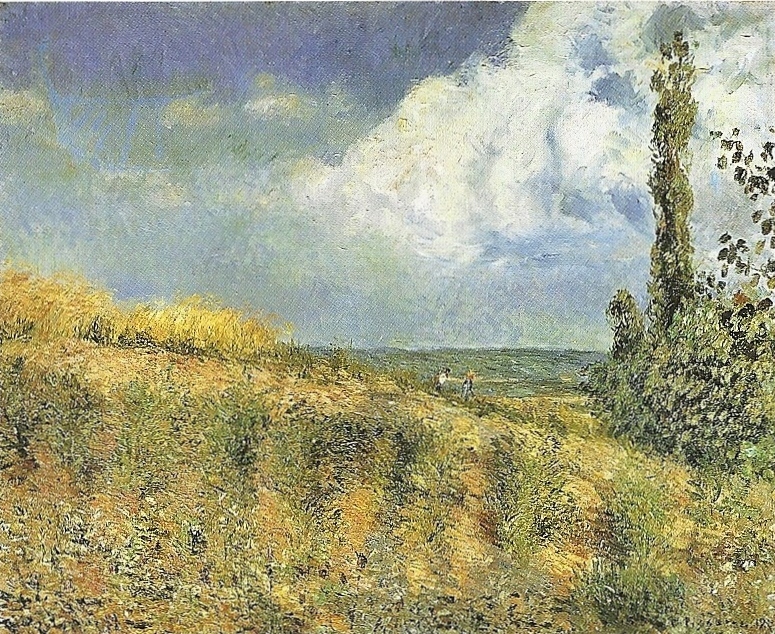 The Landscape was featured in exhibitions in Livorno and Reviso, and in 1997 it was included in an exhibition, “Camille Pissarro,” in Ferrara, Italy. It is little wonder that most of us have never seen these paintings. Though there was little opportunity to really study them, I am convinced that they are both superb examples of Pissarro’s work at the height of the Impressionist Movement. PISSARRO PAINTINGS AT PITTI PALACE IN FLORENCE?